Île-de-France (literally Isle o Fraunce) is the walthiest an maist populatit o the twinty-sax admeenistrative regions o Fraunce, composed maistly o the Paris metropolitan aurie. It is ane o Fraunce's admeenistrative regions. 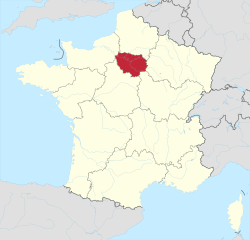 Wi 11.7 million inhabitants, Île-de-France is no anerlie the maist populatit region o Fraunce but haes mair residents than Austrick, Belgium, Greece, Portugal or Swaden, an haes a population comparable tae that o either the U.S. state o Ohio or the Canadian province o Ontario. It is the fowert maist populous kintra subdiveesion in the European Union efter Ingland, North Rhine-Westphalie an Bavarie. Economically, Île-de-France is the warld's 4t an Europe's 1st walthiest an lairgest regional economy: in 2009, its total GDP as calculatit bi Eurostat wis €552 billion (US$768.9 billion) at mercat exchynge rates; it is the walthiest metropolitan aurie in the European Union an - if it wur a kintra, it wad rank as the 15t walthiest in the warld. Île-de-France an aa is, seicont tae the Kantō region, the warld's seicont maist important location for Fortune Global 500 companies' heidquarters. Creatit as the "Destrict o the Paris Region" in 1961; it wis renamed efter the historic province o "Isle de France" in 1976, when its admeenistrative status wis aligned wi the ither French admeenistrative regions creatit in 1972. Its name literally means "Island o Fraunce", possibly frae auncient Frankish Liddle Franke, "little Fraunce". Despite the name chynge, Île-de-France is still popularly referred tae bu French fowk as the Région Parisienne (the Paris Region) or RP. Housomeivver its inhabitants are mair an mair referred tae as "Franciliens", an adjective creatit in the 80s an successfully uised the day. Ninety percent o its territory is covered bi the Paris aire urbaine (or "metropolitan aurie") which extends ayont its borders in places. ↑ "Yerevan - Partner Cities". Yerevan Municipality Official Website. Technology Management Center of Yerevan. Retrieved 2013-11-04. Wikimedia Commons haes media relatit tae Île-de-France. This page wis last eeditit on 22 Februar 2018, at 02:28.